Rimuove velocemente incrostazioni di rame/polvere di piombo, carbonio brucia, molibdeno, residui di plastica wad e ruggine anche superficiale. Concentrato, pasta non versare o gocciolare. Non corrosivo, non danneggia il rivestimento metallico o magazzino. USDA certificata Bio basato la Formula. When nothing else seems to works, this will. When you got to get it clean, removes ALL the copper from your barrel---THIS IS IT!!! Wipe out your barrel with solvent--look in the muzzle with a LED flash light--look at the copper. I use it on patches, 8-10 times back and forth, three patches and it is clean. It also polishes too, and it will not reomve metal or harm your barrel. Start cleaning with this every 10-20 shots and your rifle will start to come clean easy,the more your use it, the faster the job gets done and copper free too. I got great groups from a dead clean barrel once the barrel was cleaned a few times-(no more foulers)-clean up with solvent, dry and shoot. I USE THIS TO CLEAN ALL MY CUSTOMERS AND MY BORES. CLEANS OUT THE MOLY AND EVERYTHING ELSE. CAN'T GET ANY MORE COPPER OUT EVEN WITH MY OUTERS FOUL-OUT. I cleaned my .222 Rem which hadn't had such an effective cleaner applied to it. After about an 90mins of non-stop cleaning it came up mirror finish clean. This got off to a bad start when I opened a Brand New package and found the bottom of the tube was ruptured and the Cleaner was rapidly leaking out of the tube. I was able to transfer most of the contents to another container. Took about 40 to 50 patches & LOTS of Elbow Grease just to clean two .45ACPs - one S&W Revolver(625-2) & one Colt 1911A1 MK-IV, Series 70 with Chrome lined barrel. Plus wire brushes and other tools. I have used all kinds of products from a-z & this by far is the best product out there. 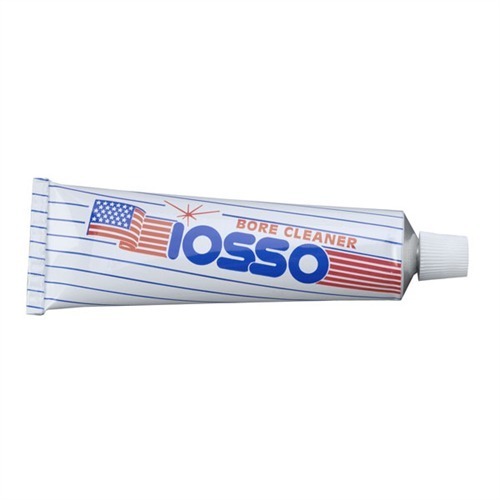 The one thing I would highly recommend is that you use this bore paste with the IOSSO brushes & triple action oil solution. It is all made to work hand in hand for the best cleaning possible. A bore scope is the only way to tell if you bore is REALLY clean. None of the wet chemical solvents I have used actually worked like the labels said they would no matter how many patches I used, but, THIS STUFF WORKS! Run a few wet patches through to remove the loose stuff, then use the paste with tight fitting patches. Two to four will usually do it if the barrel is smooth and not too fouled, clean up with wet and then dry patches. On heavily fouled and/or rough bores, letting the bore sit with a coating of Rem oil overnight before using the Iosso will help, but don't expect miracles. Cleaning can still take some time with badly fouled bores, but this stuff works better and faster than ANY liquid chemical carbon and copper bore cleaner out there and with fewer passes with a cleaning rod. I have been cleaning guns for 40 years. Their are several products that remove copper and do a good job. To remove carbon is much harder to remove I have tried several products and none of them work very good and some of them not at all. IOSSO says it remove carbon burn.A better term is carbon Glass. This product is unbelievable. I have a bore scope but if you do not have a bore scope wait until you see the pataches That come out of your clean gun. Meh. It works, but not miracles or anything. I'll try another brand next time. Parti Fabbricante: 10215 054094102157 Rimuove velocemente incrostazioni di rame/polvere di piombo, carbonio brucia, molibdeno, residui di plastica wad e ruggine anche superficiale. Concentrato, pasta non versare o gocciolare. Non corrosivo, non danneggia il rivestimento metallico o magazzino. USDA certificata Bio basato la Formula.